Are you ready for the most active week of the year? It’s time to turn off those iPads and put away the game controllers because Screen-Free Week is almost here! The Central PTO is encouraging all Central students (and their families!) to spend the week of April 22nd-26th “unplugged”. We have so many fun activities lined up for your kids, they won’t even remember how to play Fortnite when the week is over… well, that’s the goal anyway. Every day a student ‘unplugs’, he or she can submit a ticket to the PTO’s raffle box in the office. The more days students are screen-free, the more chances they have to win great prizes. Download and print your raffle tickets here. We thank our partners in providing these events, including the Riverside Parks & Recreation Department, the Riverside Arts Center, Flipside Academy of Movement, and our wonderful Central parents who have volunteered to run the activities. View the complete Signup Genius of activities. 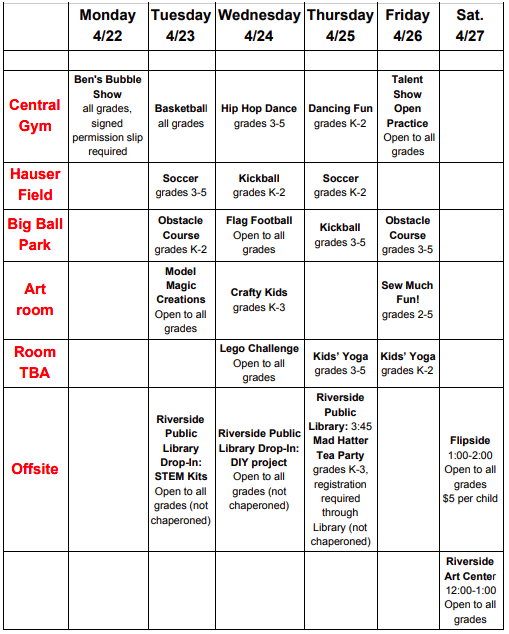 and check out the descriptions of activities. Please sign up for a maximum of two classes per child. If there are still spots available one week prior, you are free to sign up for more. If you change your mind about a class or a conflict arises, please delete your child’s signup so space can be opened for another student. The April 22nd Bubble Show is open to all Central students, but they are only allowed to attend if a signed permission slip has been turned in to the teacher by the morning of April 22nd. Note that parents are responsible for arranging their child’s transportation home after the show, and parents of younger students are encouraged to have an adult or older sibling attend with their child. Permission slips are available for download here.